My that’s a lot of acronyms. REPL means “Read Evaluate Print Loop.” You know how you can run “python” and then just type 2+2 and get answer? That’s a type of REPL. The ASP.NET Core team is building a REPL that lets you explore and interact with your RESTful services. Ideally your services will have Swagger/OpenAPI available that describes the service. Right now this Http-REPL is just being developed and they’re aiming to release it as a .NET Core Global Tool in .NET Core 2.2. Then run it with “dotnet httprepl.” I’d like another name? What do you think? RESTy? POSTr? API Test? API View? Here’s an example run where I start up a Web API. Take a moment and read that. It can be a little confusing. It’s not HTTPie, it’s not Curl, but it’s also not PostMan. it’s something that you run and stay running if you’re a command line person and enjoy that space. It’s as if you “cd (change directory)” and “mount” a disk into your Web API. 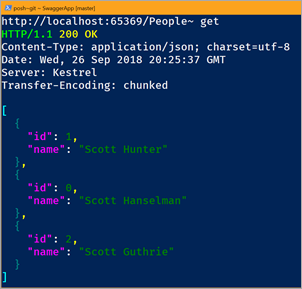 You can use all the HTTP Verbs, and when POSTing you can set a default text editor and it will launch the editor with the JSON written for you! Give it a try! You’ll want to set a default Content-Type Header for your session. I think this should be default. I’m really enjoy this idea. I’m curious how you find it and how you’d see it being used. Sound off in the comments.